October | 2014 | Right Here..... Right Now.... Glory Be! 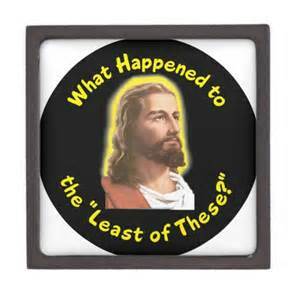 What do Willie Loman, Iowa corn and Jesus have in common? Read on…. October. It’s harvest time here in southern Iowa. Because of greater than average rainfall this summer, the harvest promises to be bountiful. As I drive out of town, clouds of dust show where the farmers are working. Great machines roll through the fields and huge trucks carry away the grain. 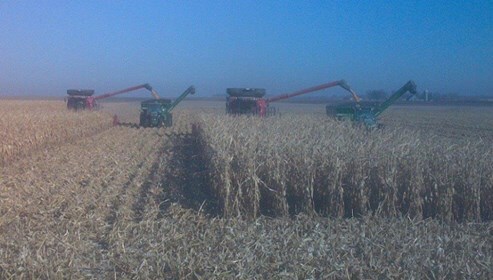 This picture was taken of the harvest on the flat prairie fields in our area, where the corn meets the horizon miles away. The concept of harvest is ancient. Early civilizations knew the importance of planting and harvesting in order to live. For centuries, it was painstaking work by hand or with animals. 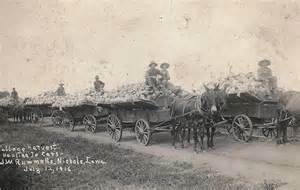 Even today, the crops are harvested this way by the Amish in our area. While modern machinery is huge, it was not long ago that harvesting machinery was relatively modest and not very technical. But whether large or small, or ancient or new, the harvest must go on. It is essential in this circle of life. My father was a farmer. His farm was small and hilly. He worked with small old machinery. 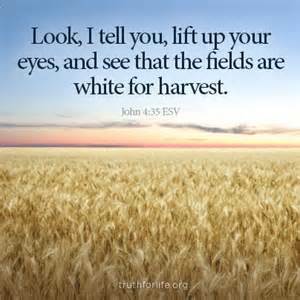 But in the end, he did what farmers have done in the past….. bring in the harvest….. and what farmers do today…… bring in the harvest. 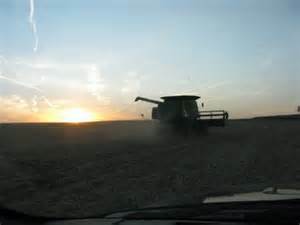 After the spring planting, and as the summer months go by, the farmer eyes the skies, prays for the right amount of rain at the right time, hopes the markets stay steady, readies his machinery and tools, and prepares the trucks, bins and barns. He chops the weeds that choke out the good grain. He holds his breath as storm clouds gather in the west. 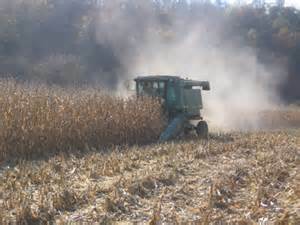 And then at just the right time, the tractors, combines and corn pickers head out to the fields. My father would harvest well into the night. We would take sandwiches and mason jars of water out to the fields for him. There was a narrow window of time between rains where he could safely harvest . I remember times when it rained too much, turning the fields into mud pits. And Dad had to wait until the ground froze to finish the harvest. Despite growing up on a farm and knowing the drama of the farm, I did not become a farmer. I became a teacher, instructing my students in literature, composition, speech, theater, and journalism. It was a different kind of drama. 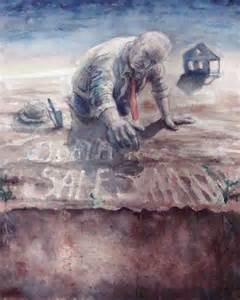 One of my favorite pieces to discuss with my students was Arthur Miller’s Death of a Salesman. Willie Loman was tragic, and as a farmer’s daughter, I could see some aspects of Willie’s actions that my city students could not see. None of it could happen if the kernel did not die. 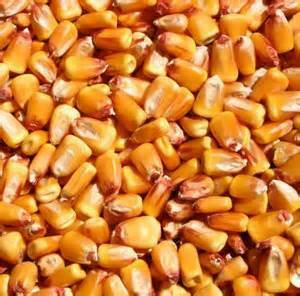 The kernel had to be put into the dark soil, with the right amount of heat and moisture, and then the kernel died. 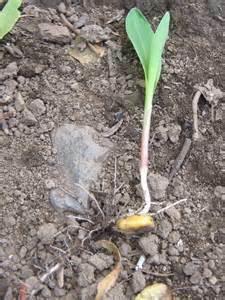 Out of that death, came the sprout that developed into the stalk of corn. Willie Loman understood this cycle of life. He had spent his life in failure: failure as a father, failure as a faithful husband, and failure as a salesman. His past was painful, his present was fragile and he could not see a future. In his horribly distorted reasoning, he decided to plant a garden. It is dark, and he traces rows in the small yard which receives little sunlight. He drops in the seeds, mumbling to himself about giving his sons another chance. In a few minutes, Willie will leave home and have a deliberate car accident. He dies, like the seed. His damaged mind had begun to equate the seed, dying in order to bring new life, with his death, which he believed would bring new life to his no-good sons. Willie had an idea of this circle of life, but he left out one very important part: his life insurance. He did not pay his premium. And so his sacrifice of himself came to nothing. There would be no life insurance to give his sons a new start in life. There would be no harvest. I don’t know what grain Jesus might have been referring to in this verse. 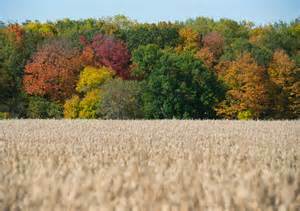 Here in Iowa, whether it is corn, wheat, or beans, the plants get lighter and lighter as the harvest approaches. 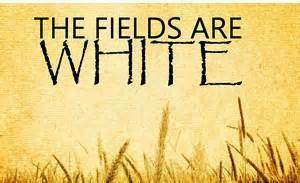 The fields are no longer green. But Jesus was not referring to plants; he was referring to a world filled with people who needed to know about Him. Look! There they are! Go and harvest! I’ve been going in a few different directions with this concept of harvest. Let me try to tie the strands together. 1. 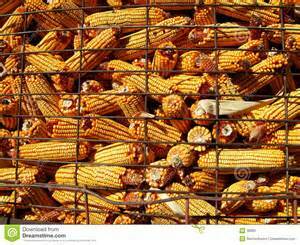 When the kernel of corn dies, there is a sacrifice of form. 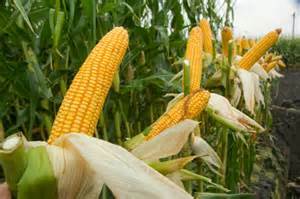 The corn no longer is the intact kernel. But the result of that sacrifice (the harvest) cannot occur without the preparation and wisdom of the farmer. 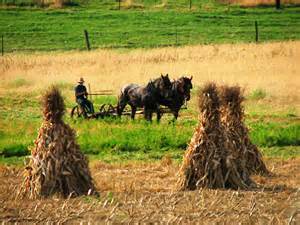 And even there, the farmer must make his own sacrifices of time and labor in order to bring in the crop. 2. When Willie Loman died, there was a sacrifice of life. His body and soul were no longer intact. But the desired harvest of that sacrifice would not happen because Willie had not prepared with wisdom concerning his life insurance. 3. When Christ died on the cross, there was a sacrifice of Himself for the sins of the world. “For God so loved the world, that He gave His only begotten Son, that whoever believes in Him will not die but have eternal life.” (John 3:16). The fields of humans are ready for His message of life. But that complete harvest won’t happen without the preparation of believers to share Christ’s message. And yes, it calls for sacrifice on the part of believers: sacrifice of money, time, and labor. Harvest. Life. Sacrifice. It’s all one. 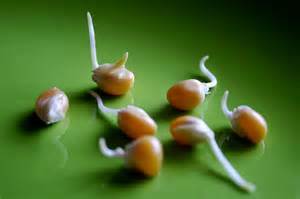 The sacrifice of one seed to bring forth many seeds, which will continue to nurture life. The sacrifice of One who was both God and man, to bring forth many people into eternal life. O Father….. Let me not be a Willie Loman, understanding some aspects of life, but not grasping the part that would give meaning to his sacrifice. Let me not be a Willie Loman, operating in darkness and not in light. Let me not be a Willie Loman, who lacked wisdom and preparation for the harvest he desired. Father, equip me with Your wisdom. Give me courage to go to the harvest, and not let Christ’s death be for nothing. The Least of These…… Who are They? Just Thinking…… They walk among us. They are here…. and now….. They make us uneasy. They are a problem. Sometimes they are invisible. Sometimes they are seen too much. Sometimes they make no sounds. Sometimes they are horribly noisy. They don’t fit in. They make messes. They are awkward. We want them to go away. They are…….. The Least of These. And that got me thinking about church: a place where my brothers and sisters in Christ come together. Who is the least of these in church? Which of these shall we leave out of church? Shall we lower the lights for dramatic effect….. and leave out those with poor vision? Shall we have steps into the church…. and leave out those who can’t climb steps? Shall we send out all announcements and prayer requests via email….. and leave out those who don’t have computers? Shall we sing only higher pitched classical music….. and leave out those who can’t stretch to the higher notes? Shall we sing only the latest tunes….. and leave out those who yearn for hymns? Shall we only have church in one building….. and leave out the homebound and the ones in nursing homes? Shall we only have church at one time….. and leave out those who must work at their job during that time? Shall we read all Scripture from the King James…. and leave out those who struggle with this older language? Shall we read all Scripture from a contemporary version…. and leave out those who love the beauty and cadence of the older version? Shall we back up prayers with a musical backdrop….. and leave out those with a hearing handicap? Shall we place only the young mothers in the nursery….. or only the older women……and leave them out of worship? Shall we not even have a nursery…… and discourage all the young parents and leave the babies out of their first church experiences? Shall we put those who speak a different language…. or no language…. or a peculiar language of their own in the back out of sight….. or sit with them and leave our comfort zones? I don’t know the answers to these questions. I’d like to give a formula for perfection, but I can’t. All I know is that I need to actively search for the answers. I do wonder about preconceived notions. I ponder a seeming selfishness in wanting things to be “my way” without regard to the needs of others. I worry about those who seem to be invisible and silent, so no one sees them or pays attention to their needs. I worry about the church being blind and deaf. In an ideal, perfect world, what would the church look like? How would it function? Would the least of these be cared for? Would somehow each one fit into the church? Is there a place for every believer? The least of these are among us. They may not be the hungry or thirsty or naked or sick or in prison, but they are the overlooked and ignored in our churches. What shall we do to include them and nurture them? 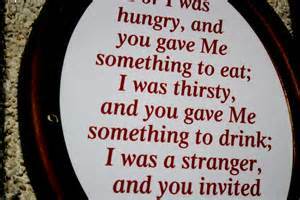 Father….. Forgive me for the times that I did not pay attention to the least of these. Open my eyes to how I need to help others be fully within the church body. Give me direction and boldness and courage and wisdom to do Your will. Forgive us for overlooking the needs of others….. the least of these.